Wagon Train was a 60 minute (90 minutes in season 7 only) western action series on NBC for its first five seasons and on ABC thereafter. It told the stories of pioneers travelling through the unsettled territories to reach California. Along the way they encountered "wild" Indians, cattle rustlers, con men, blizzards in the mountains, running out of water in the desert and every other hazard you can imagine. The series also often explored the motivations that caused average people to leave civilization for the unknown lives they would find in the Western United States! Ward Bond started his acting career when one of his fellow football players at USC got him some work as an "extra". Oh by the way, his team mate was John Wayne! By the way, Ward Bond's first job was in the 1929 musical "Words and Music". That was also the first movie where John Wayne got listed in the opening credits! Each season, the Wagon Train would head out from St. Joseph, Missouri and would reach California at the end of the season! It was almost like making the treck yourself! Wagon Train had 2 wagonmasters during its run. Ward Bond died in November of 1960 and John McIntire took over as the head man in the spring of 1961. 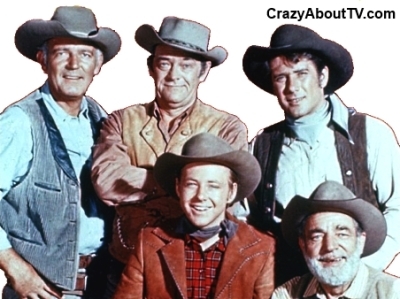 It's almost hard to believe but, in fact, after shooting the Wagon Train TV show in color for its seventh season, ABC decided to return to black and white episodes in the eighth season! No big surprise that that was also the final season! Actually, the show did drop in the ratings during the seventh season but ABC had also lengthened it from one hour to 90 minutes and it was up against a new hot (and newer) series called "The Virginian". Robert Fuller (Cooper Smith) appeared in the final 2-part episode of "Walker Texas Ranger" as the charachter Wade Harper. He also starred on the hit 1959 TV show "Laramie" as Jess Harper. His first role on screen was a bit part (uncredited) in "Gentleman Prefer Blondes" starring Marilyn Monroe and Jane Russell! Wagon Train was not only popular with audiences. Actors and actresses were very easy to get as guest stars. Here's a list of just a few: Eddie Albert, Dan Blocker, Ernest Borgnine, Lee Van Cleef, Chuck Connors, Lou Costello, Bette Davis, Bruce Dern, Rhonda Fleming, Sterling Hayden, Lee Marvin, Martin Milner, Ricardo Montalban, Agnes Moorehead, Leonard Nimoy, Leslie Nielsen, Ryan O'Neal, Cliff Robertson, Cesar Romero, Mickey Rooney, Barbara Stanwyck, Dean Stockwell, Robert Vaughn, Shelley Winters, James Whitmore and Keenan Wynn! One reason that big stars were willing to appear on Wagon Train was that the storylines often made them the main character. The regular Cast were often delegated to supporting roles while the guest-star became the main focus of the show. Many years after his role as Duke Shannon on Wagon Train, Denny Miller appeared on the final episode of the TV mini-series, "Lonesome Dove". He played the part of Sheriff Owen Kearney. By: "Henri Rene & Bob Russell"
Rollin over mountain where there ain't no pass. Side by side on the Wagon Train. Wonderin if he's ever gonna shoot you down. If she'll ride on the Wagon Train. Gotta keep em on the run. Only had a wagon and a forty four. Thank you for visiting our Wagon Train page!